Growing up, Fridays during Lent meant dinner consisted of baked fish, macaroni and cheese, tuna casserole, fish sticks, or some other fairly simple meal. It was a limited menu but as kids we liked it. And besides, it was only for about 6 weeks of the year. Years later I met my husband and discovered that he didn’t eat meat on any Friday of the year. As much as I liked the non-meat meals we had in my childhood home, I wasn’t so sure about eating them every Friday all year long. But along with learning the reason for why he and his family abstained from meat every Friday of the year, he also introduced me to a much larger variety of meatless meals. He makes salmon a couple different ways, pasta with pesto and shrimp or scallops, falafal with a tahini sauce he makes himself over a simple salad, and he likes to experiment in the kitchen so sometimes dinner is a surprise. One of the simpler meals that we make is our version of Salad Niçoise. This salad is filling for those big eaters in the family and easily customizable for the picky eaters. And if you’re not a kitchen whiz (like me) it’s pretty easy to put together. Currently our family consists of four people: two adults and two small children who are still on the liquids and pureed foods diet. So we make this salad for only two people, but expanding it for larger families is very simple. Ingredient amounts are listed as per adult person, adjust as necessary. Boil the eggs and potatoes until done and then place in the refrigerator to cool (preferably 2-3 hours). 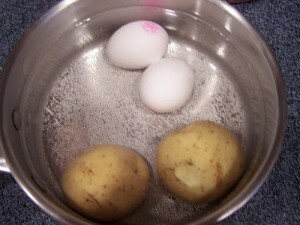 Boil the eggs and potatoes together, no need to dirty more than one pot. When you’re ready to prepare dinner, steam the green beans. While those are steaming create a small bed of lettuce on each plate to be the base of your salad. Once the green beans are tender place as many as desired on top of the lettuce on one side of each plate. Slice the tomatoes, potatoes, and eggs (after peeling the shells off) and place in rows on each plate. 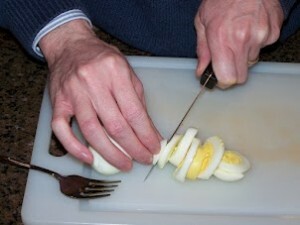 Use a sharp knife for slicing the eggs. Create another row of the tuna. Add kalamata olives. For the dressing, mix all ingredients in a small jar. Close the lid and shake vigorously. Drizzle over salad. This can be a very filling salad. Often we leave off either the green beans or the potatoes rather than having both. We have also replaced the green beans with asparagus when it was difficult to find decent fresh green beans. Personally, I don’t care for olives, so I skip those on my salad. 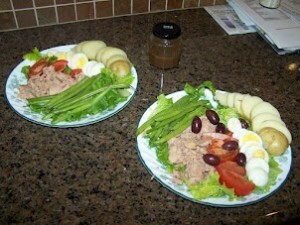 I’ve also seen Salad Niçoise done with grilled tuna steaks, if you want to get fancy. For the picky eaters in your family, get creative with vegetables they will like. If you’re creative, you can experiment and I’m sure you’ll find something that everyone in the family can enjoy. Add some salt and pepper for extra flavor. robbie - I’m starving and this salad looks soooo good right now! (Especially the olives!) Plus, who knew to boil eggs and potatoes together–how wonderful! I would make it tomorrow…if only my family ate tuna. I might just make it anyway, with fish sticks.